So, just like in the first two TRIP films (THE TRIP and THE TRIP TO ITALY), it begins with a phone call between Welsh comedian/T.V. personality Rob Brydon and the much better known British actor/writer/producer Steve Coogan. 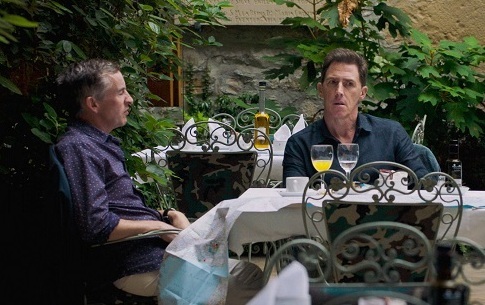 “Let’s do a series of restaurant reviews – this time, a trip to Spain for the New York Times,” Coogan suggests to Brydon and off we go for another round of immaculate meals at posh restaurants, where the dinner conversation consists of dueling celebrity impressions. The traveling fine dining duo trot out their comical takes on the voices of Michael Caine (one of their specialties), Mick Jagger, John Hurt, Marlon Brando, Robert De Niro, Sean Connery, and Roger Moore, among others (this film is heavy on the Moore mimicry, which is interesting because it was shot in 2016, way ahead of the James Bond actor’s death in May of this year). They take a road trip along the coast of Spain, stopping in villages and towns such as Getaria, Hondarribia, Santiago de Compostela, Sos del Rey Católico, Prejano, and Cuenca, Almagro, and Granada. Now I had to look those places up (thanks to The Telegraph’s The stunning filming locations from the Trip to Spain), because they aren’t properly identified in the movie. Neither are the names of the restaurants they visit, which is odd because they are supposedly reviewing them, and they frequently cut to shots of the chefs preparing their food in the kitchen. Apart from that, there’s not many shots of the food either. No, the scenery and foodie theme is just a backdrop to the impressions with each droll broke improvising bits and skits with their exaggerated characterizations. This can get pretty annoying especially when the impressions falter. We learn that Coogan does a better Jagger than Brydon (Brydon even does Jagger doing Michael Caine at one point), Brydon does a better Sean Connery than Coogan, but neither of their Roger Moore voices is spot on, though Brydon’s comes the closest. This makes for most cringeworthy scene in the movie, where Brydon rambles on and on as Moore while Coogan, and their lovely lady guests (Claire Keelen, Marta Barrio) sit by awkwardly trying to converse. They have these meals, then retire to their hotel rooms and have phone conversations – Coogan with his agency, son, and girlfriend; Brydon with his wife and an agent claiming he can make him a big star. These suggest conflicts and some sort of plot development but not much comes from them, it’s always back to the impressions. This is frustrating because Coogan has a possibly juicy storyline about a project he’s working on – a follow-up to PHILOMENA, which he starred, co-wrote, and produced – getting green lit, but they want to bring in another writer. Coogan starts off the film on a high from his success with PHILOMENA (something that he brings up often), but there are hints that his star isn’t on the rise anymore, while Brydon, happily married with kids, may be on the verge of a breakthrough but these ideas never go anywhere. Instead we get scenes of these guys dressing up like Don Quixote and Sancho Panza for a photo shoot, and making a stop at the Monastery of San Juan de la Peña in Jaca, Spain, which is fabled to be the resting place of the Holy Grail – something they, of course, riff on. As with the previous films, THE TRIP TO SPAIN is the result of six episodes of the BBC TV series of the same name being edited together into a feature film. This makes me wonder if this material might be less tedious in its original format. What we have here is a aimlessly talky travelogue, with these sad blokes doing endless impressions for an overlong running time (the film is one hour, 47 min). Despite some funny moments, such as Brydon’s Brando reciting Monty Python’s “The Spanish Inquisition” sketch, and incredible looking locations, this third time is so not the charm.